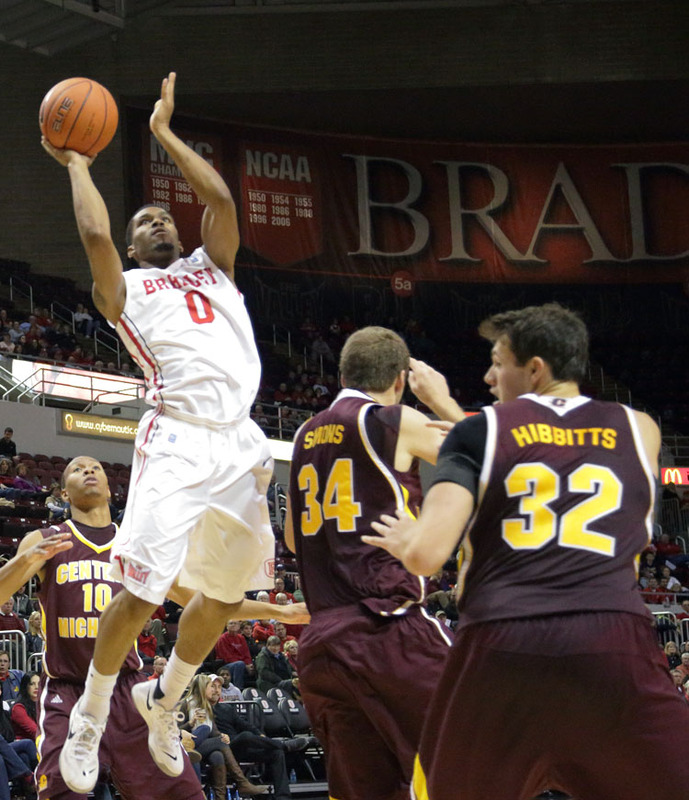 Bradley (12-17, 7-9 MVC) used a season-best 14 steals to force 23 Loyola-Chicago turnovers in a 55-38 victory Saturday night at Carver Arena. 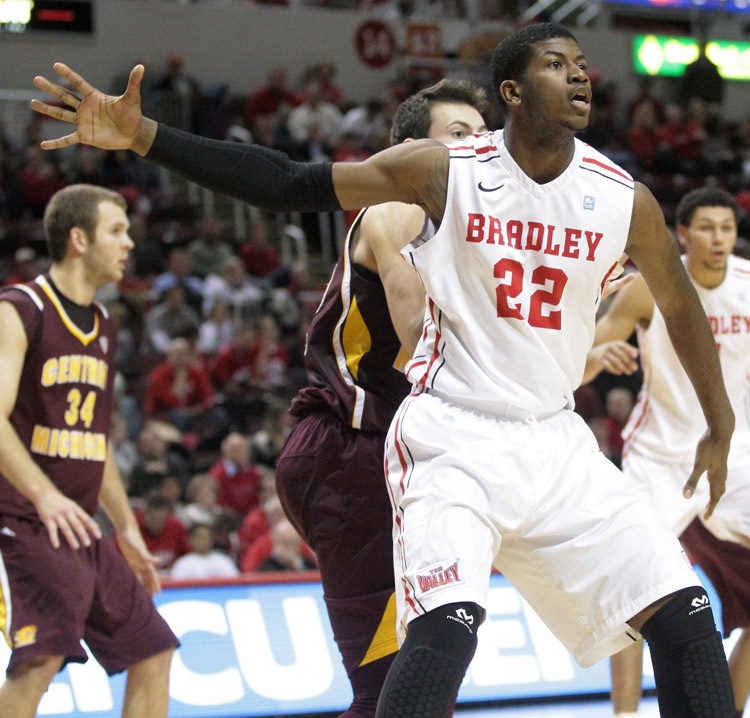 Bradley limited the Ramblers (9-19, 4-12 MVC) to the fewest point total by a Braves opponent since a 76-35 win against Oakland Dec. 6, 1997. 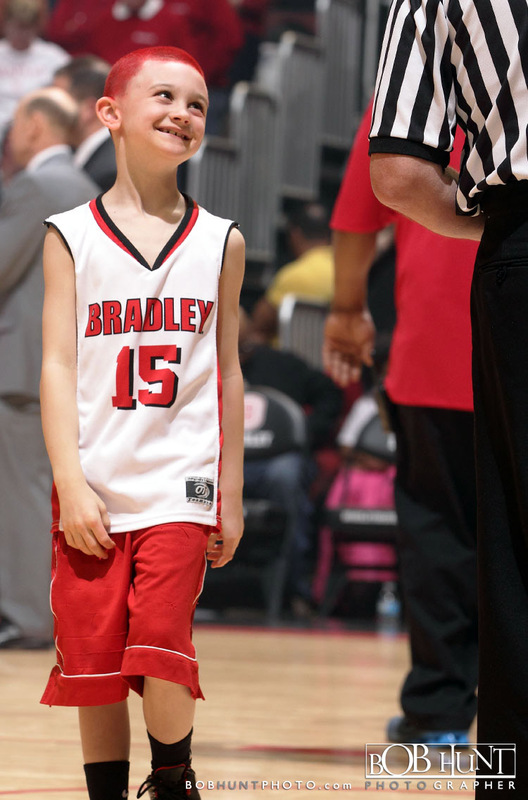 For the second time this year, a Bradley opponent did not produce a double-digit scorer and Loyola shot just 26.5 percent (13-49) from the field, including 1-for-18 (.056) from 3-point range. 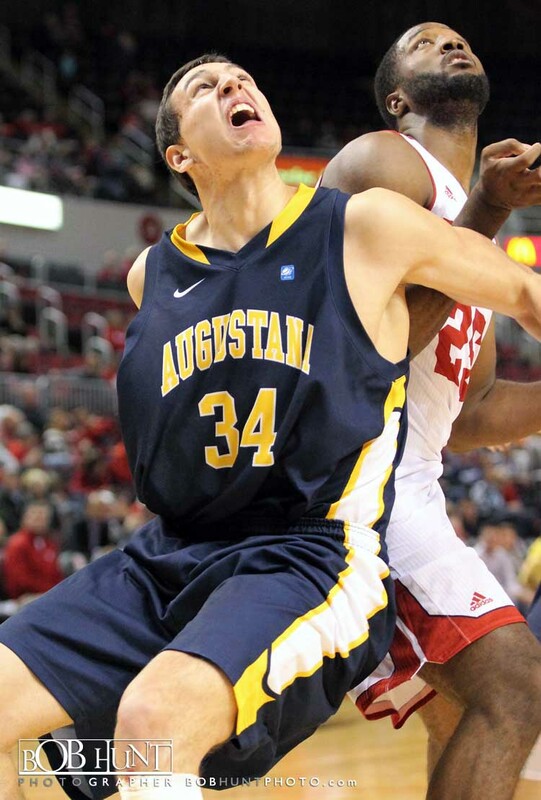 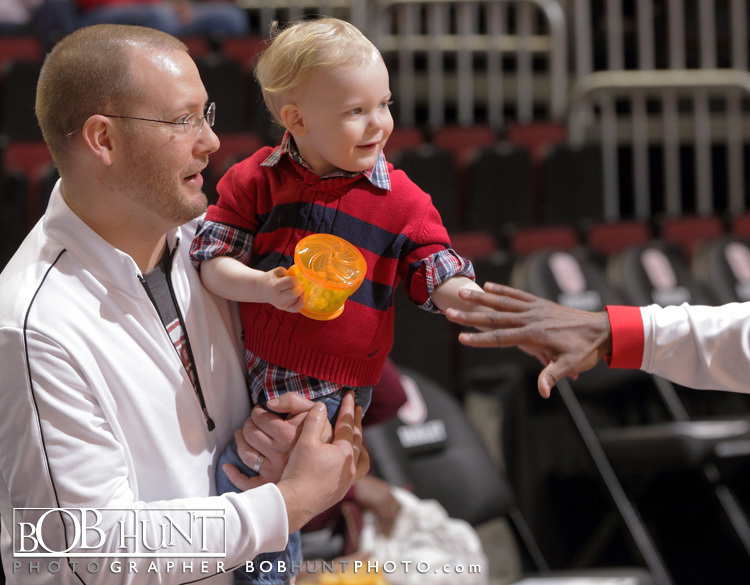 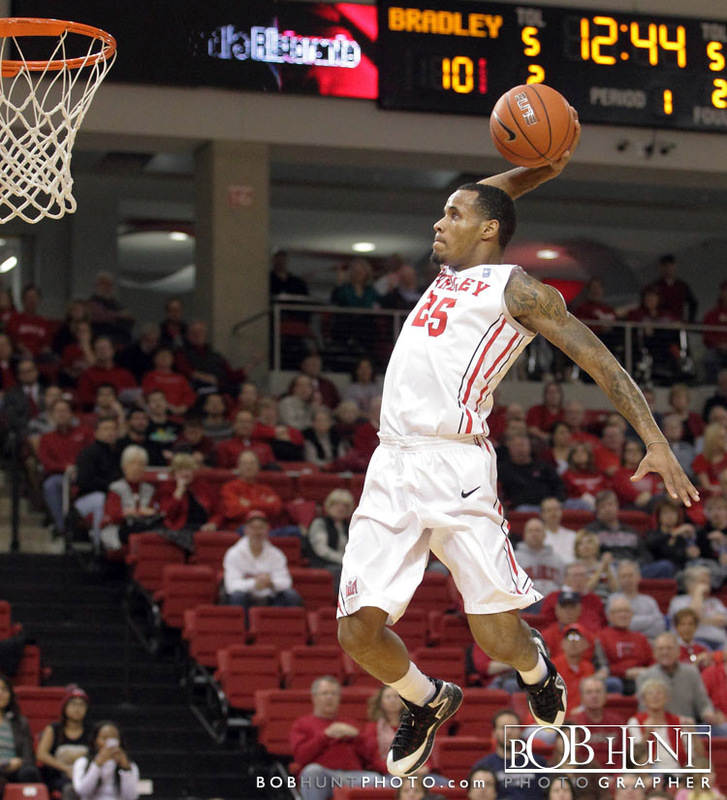 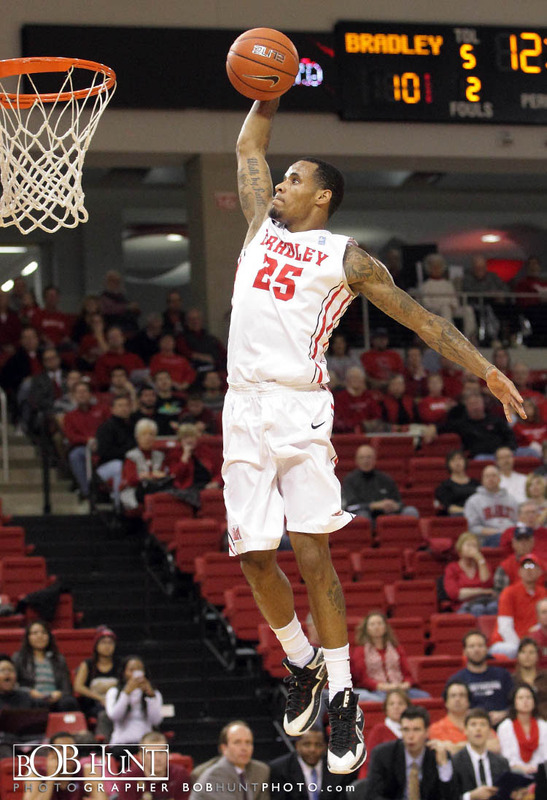 Walt Lemon, Jr. finished as the game’s only double-digit scorer with 16 points, pushing him into the top 50 (49th) in Missouri Valley Conference history with 1,659 career points. 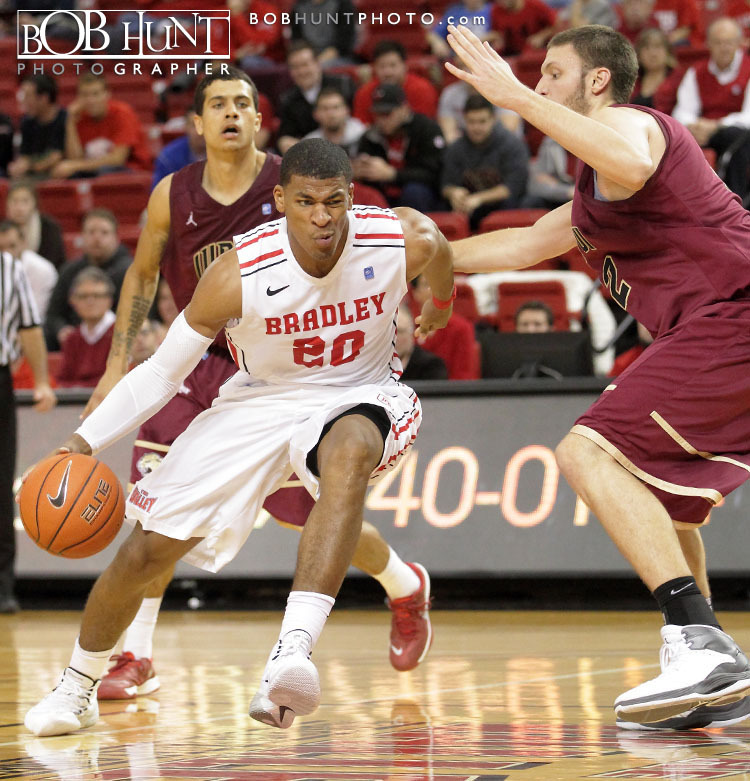 He also registered five of Bradley’s 14 steals, moving past Daniel Ruffin into fourth place in school history with 211 career steals. 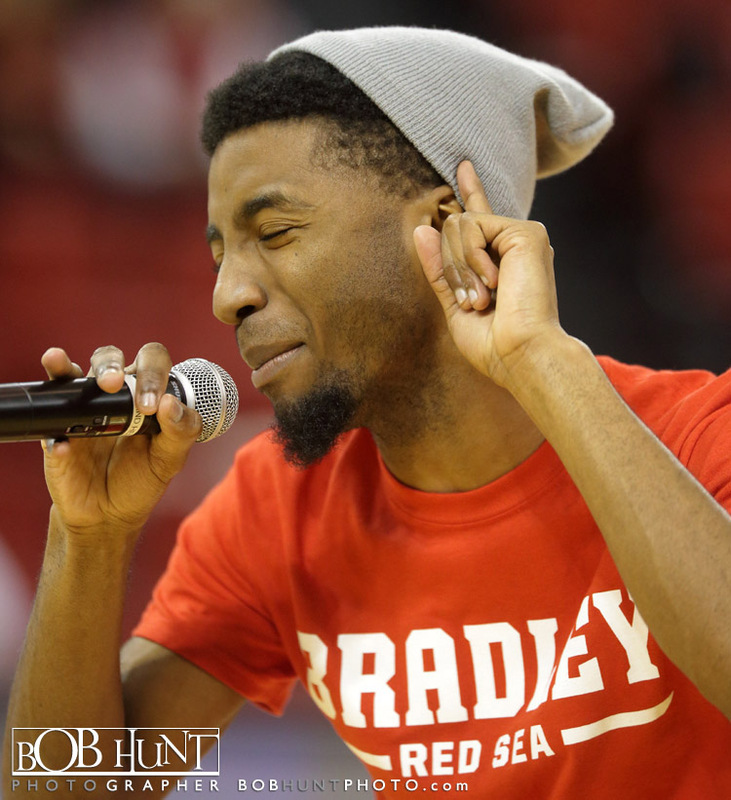 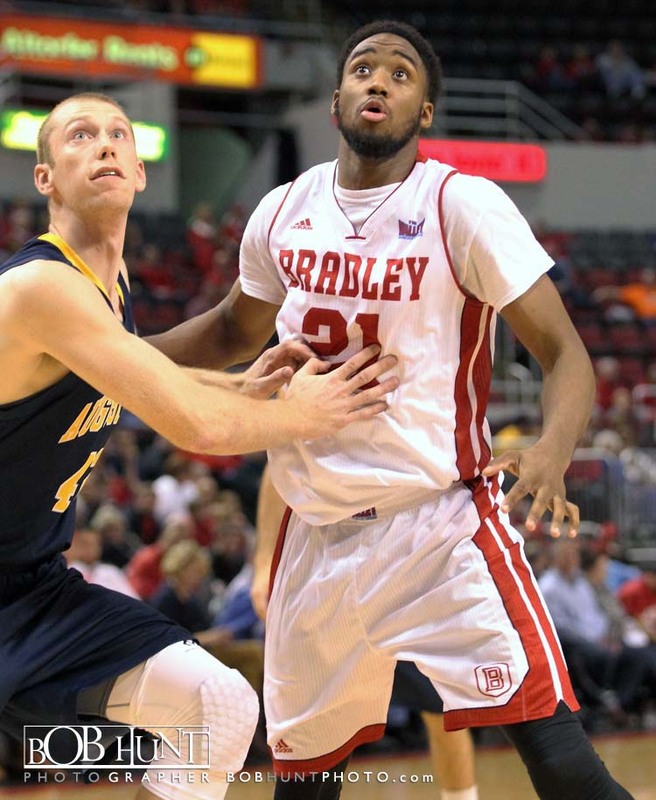 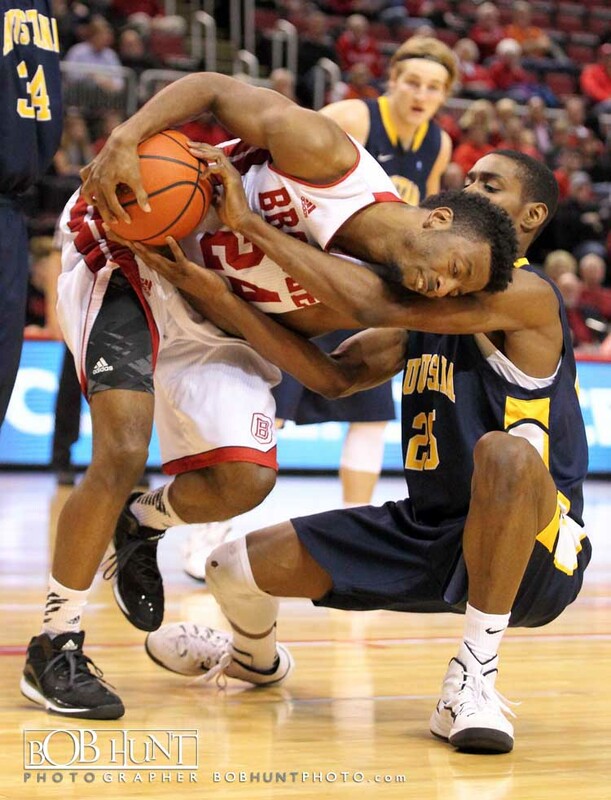 Lemon is one of four Bradley seniors who will play their final Bradley Basketball home game Tuesday night when the Braves host #3 Wichita State (29-0, 16-0) in a nationally-televised game at Carver Arena. 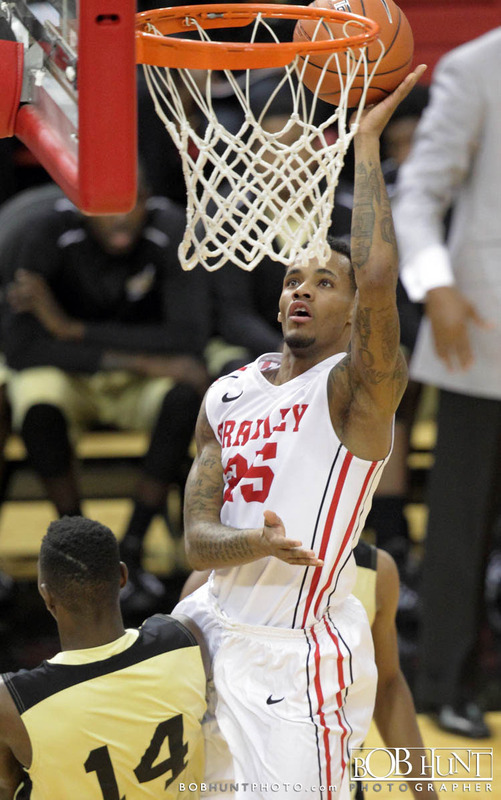 The nation’s lone unbeaten team, Wichita State is trying to unseat the 1985-86 Bradley Braves (16-0) as the last undefeated Valley regular-season champion. 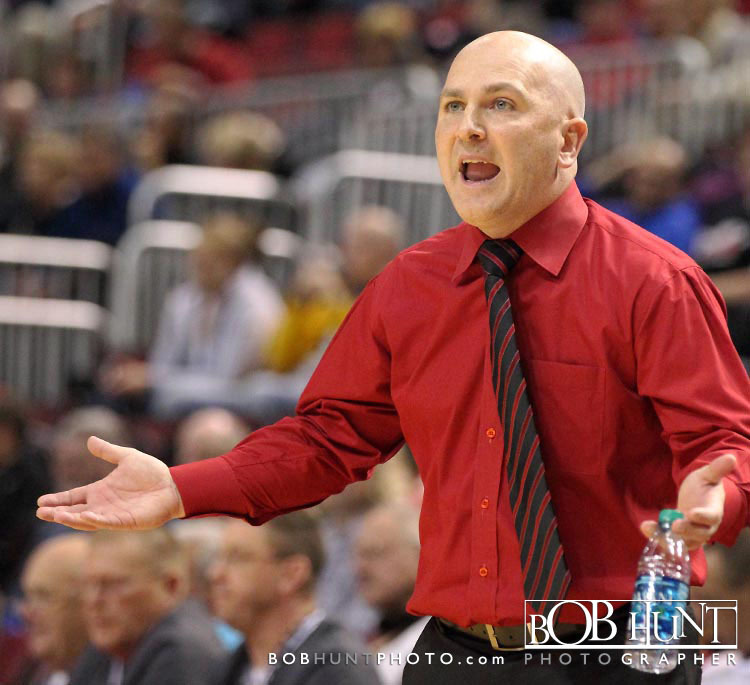 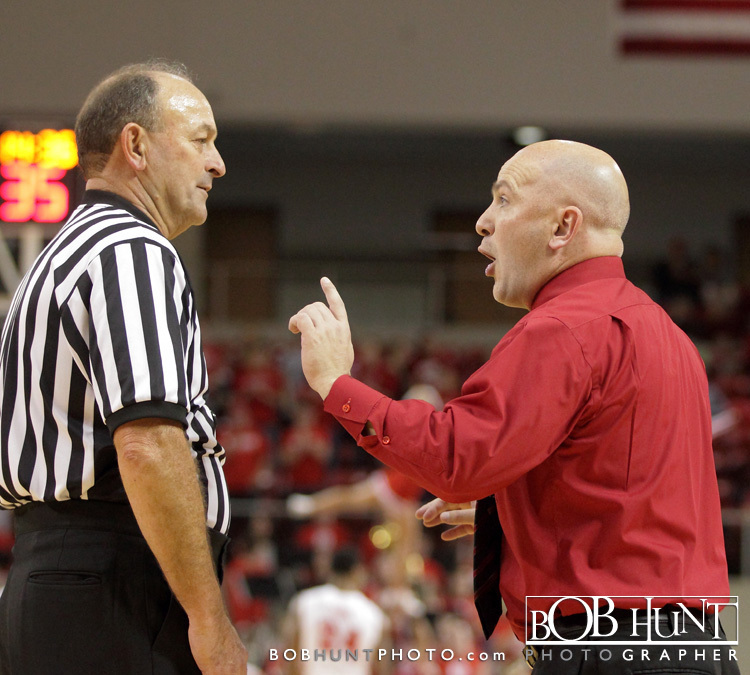 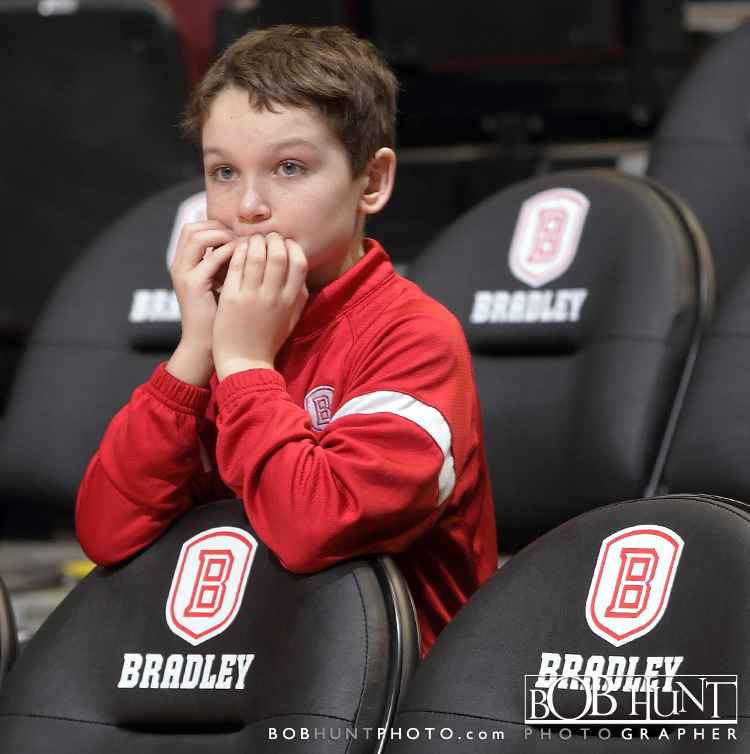 If in theory it is difficult to win a college basketball game on a cold-shooting night, Bradley University proved the point Wednesday night, when the Braves (5-3) dropped their first on-campus home game since the 1982 MVC Tournament in a 72-66 loss to IUPUI (2-7) at Renaissance Coliseum. 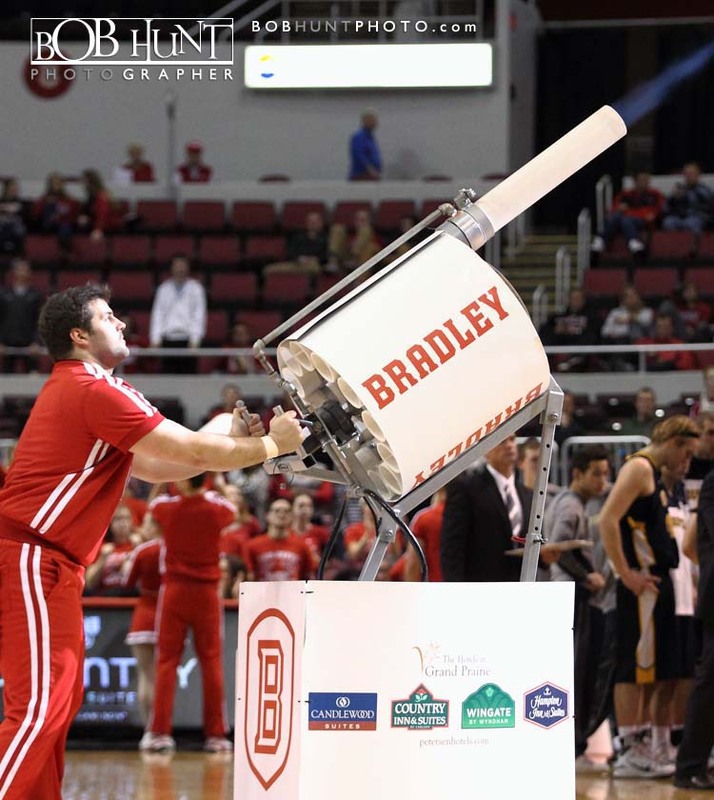 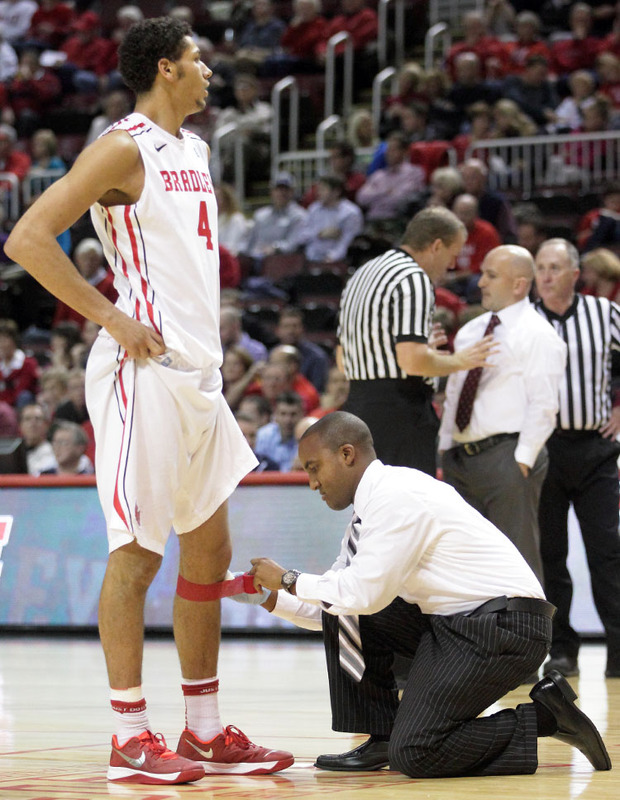 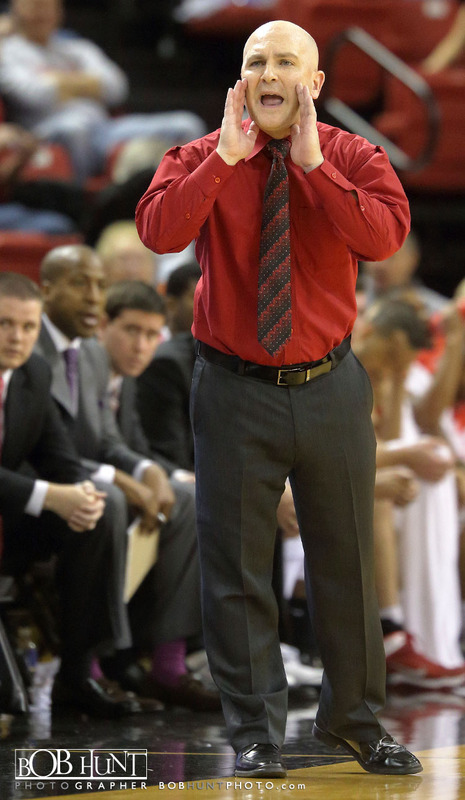 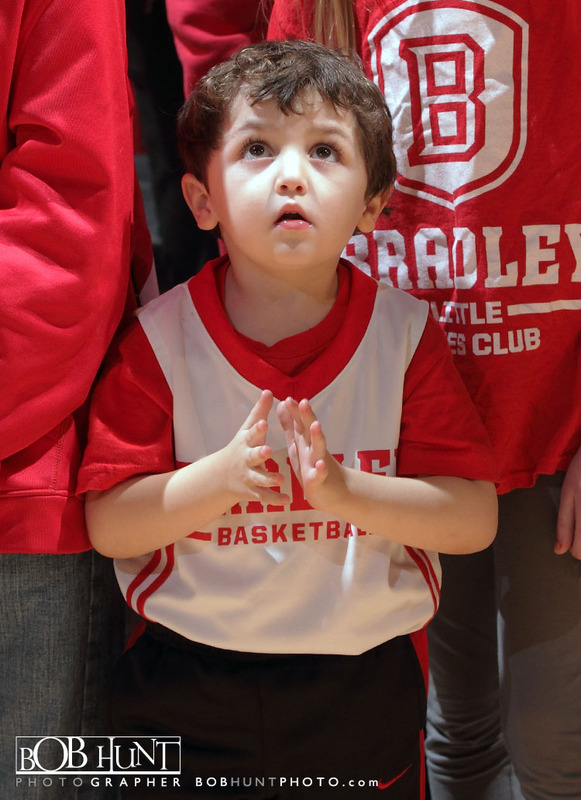 Bradley, which had been 5-0 in the on-campus facility since it opened in 2010, shot just 31.3 percent (21-67) from the field, 13.6 percent (3-22) from 3-point range and 67.7 percent (21-31) from the free throw line, cold numbers that offset 23 offensive rebounds, a +14 rebound margin (48-34), just 11 turnovers and 10 steals. 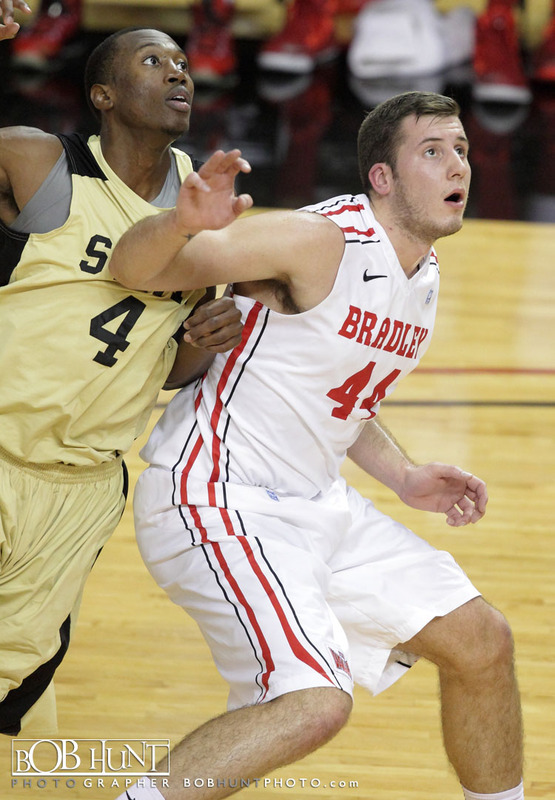 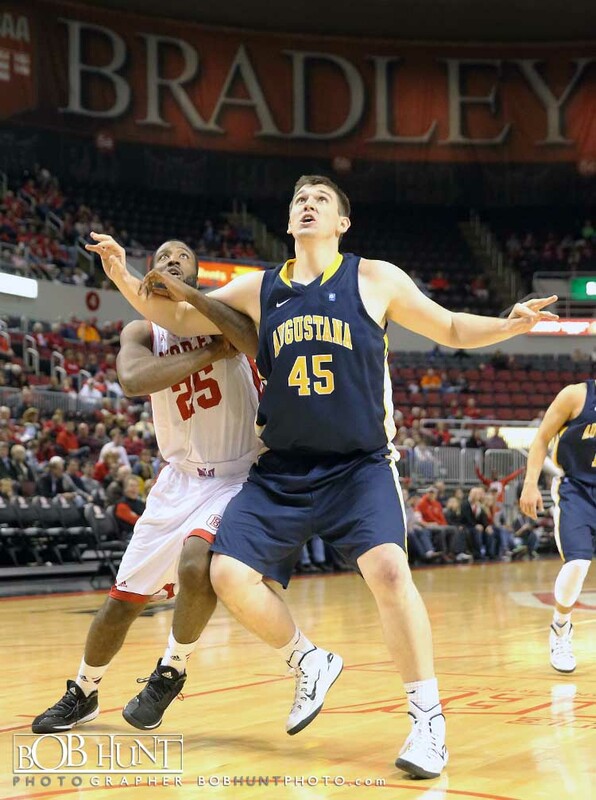 Bradley’s 23 offensive rebounds were the most by the Braves since snaring 24 in a 69-67 overtime loss at Wichita State Dec. 30, 2005. 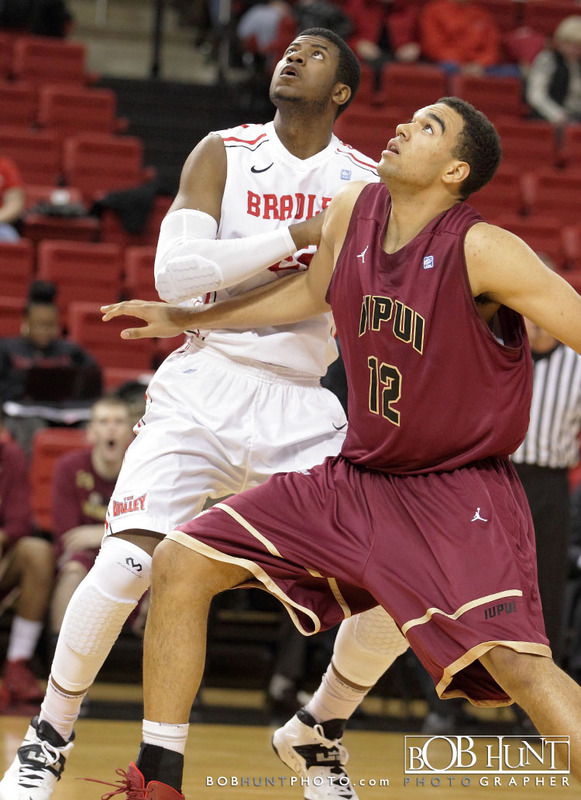 Junior guard Ian Chiles led the Jaguars with a game-high 20 points, while junior Khufu Najee chipped in 19 points and six assists and Donavan Gibbs added 13 points of the IUPUI bench. 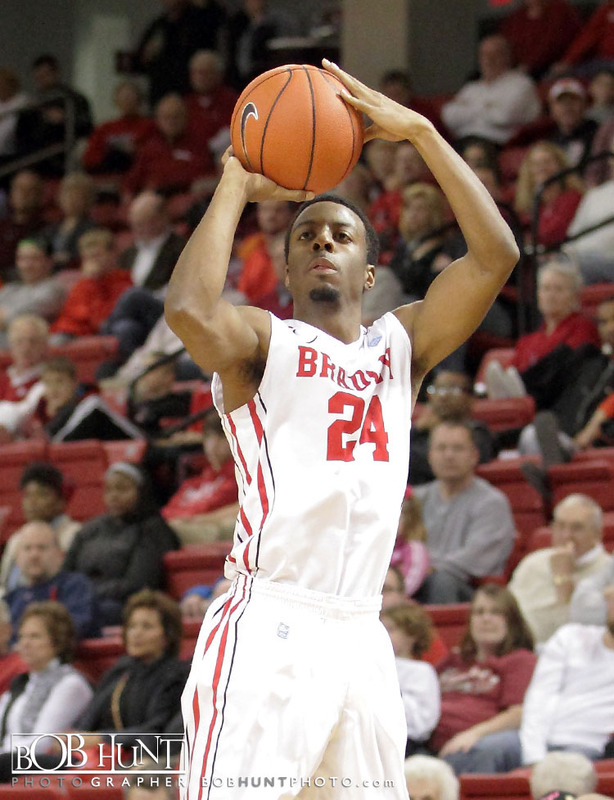 Sophomore Omari Grier led the Braves with 17 points, despite a 3-for-13 effort from the field. 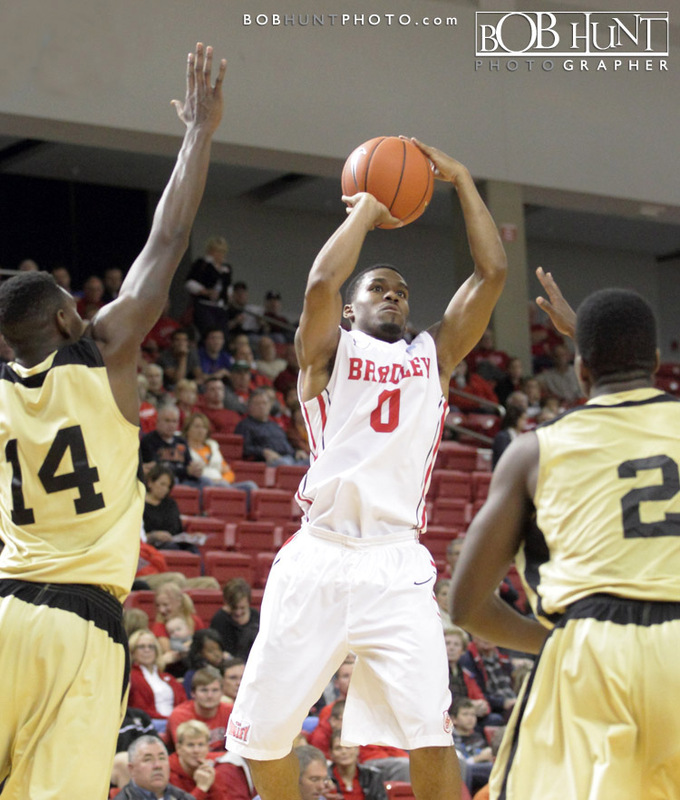 Walt Lemon, Jr. and Tyshon Pickett both added 13 points, but the duo combined to shoot 9-for-31 from the floor, and Auston Barnes added 11 points off the bench. 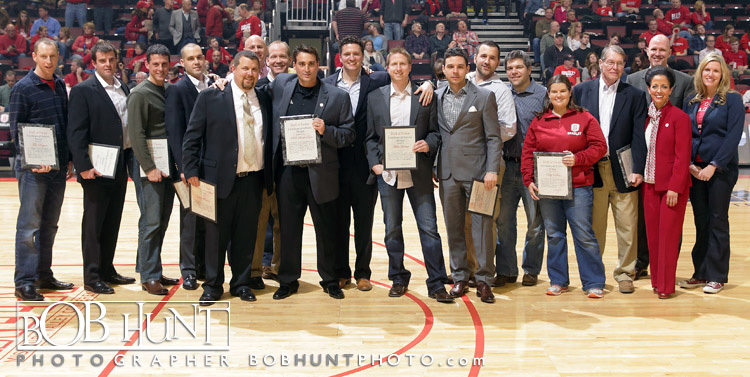 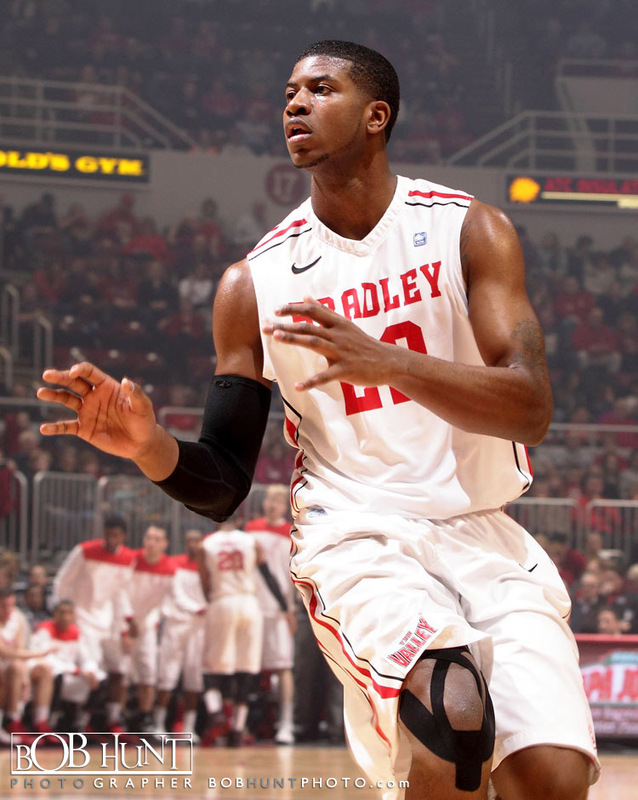 Barnes, Pickett and Jordan Prosser all shared team-high honors with eight rebounds. 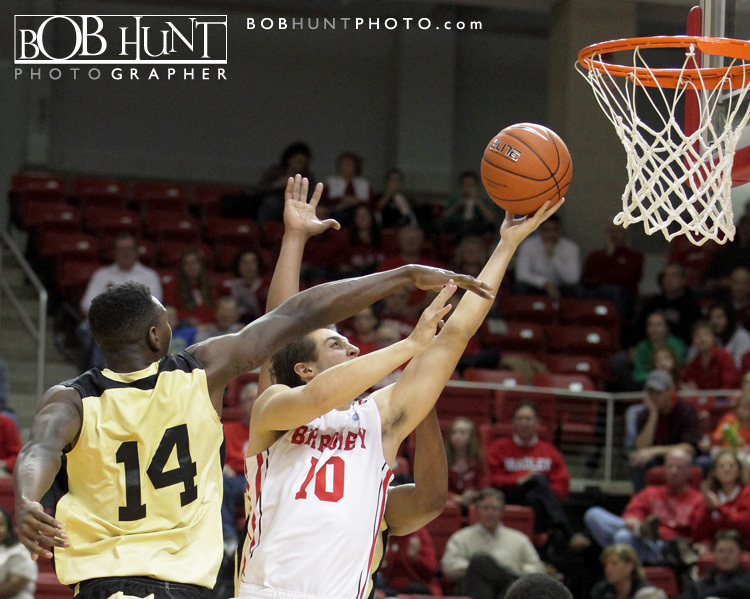 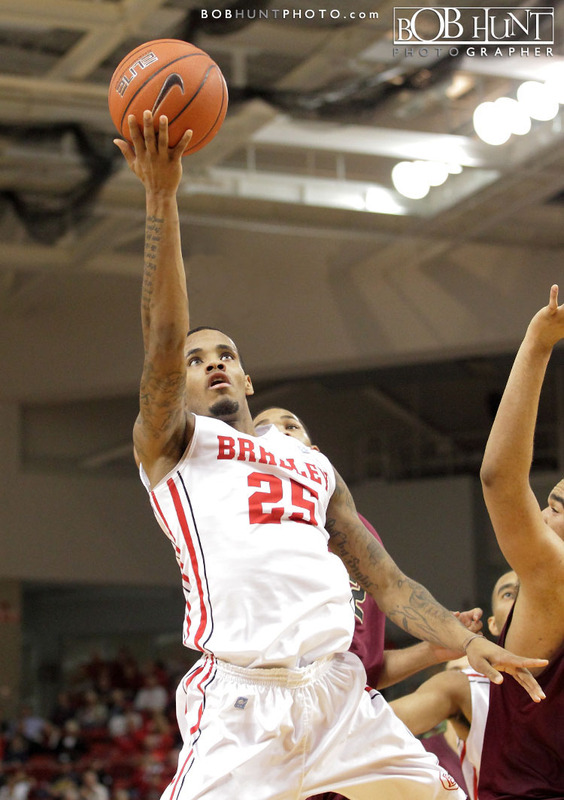 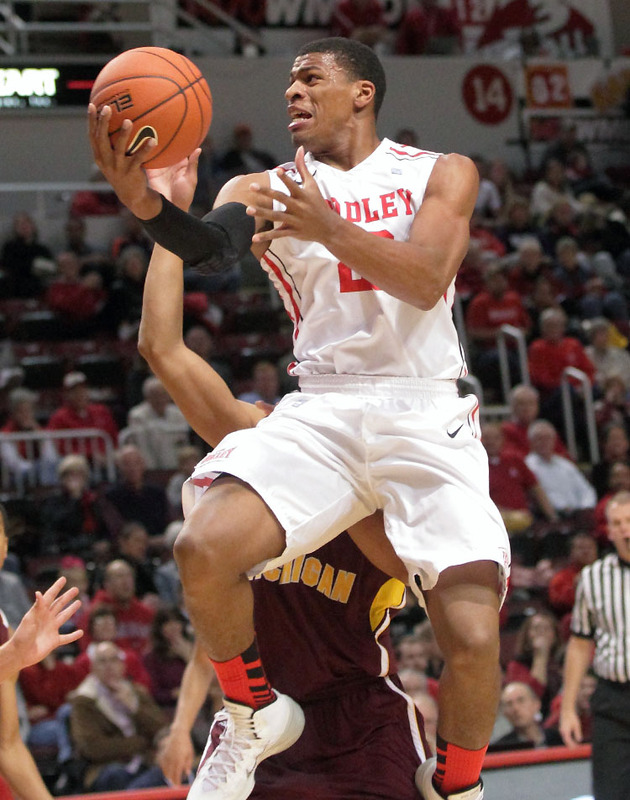 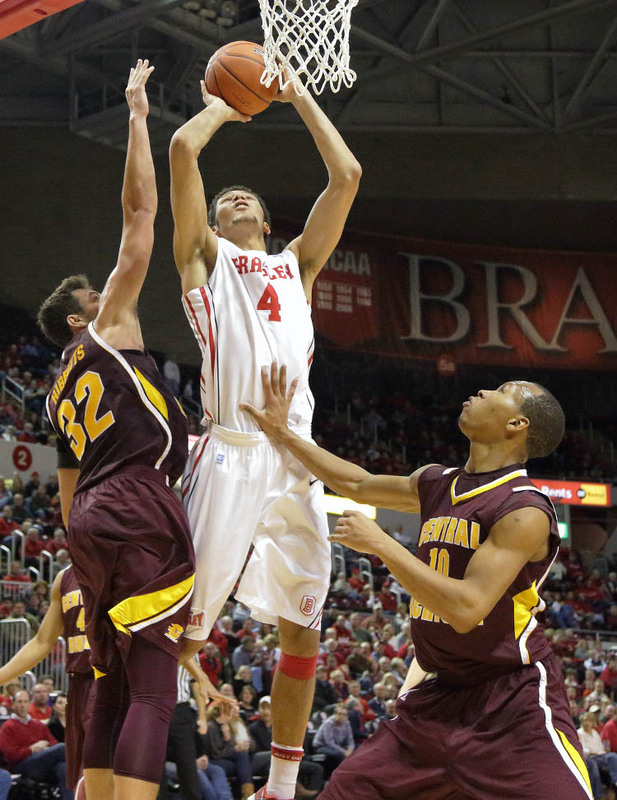 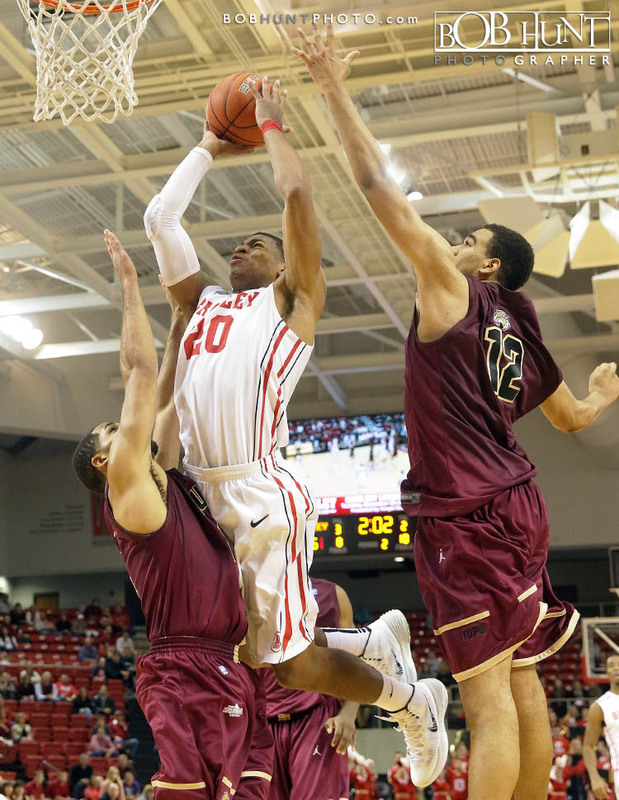 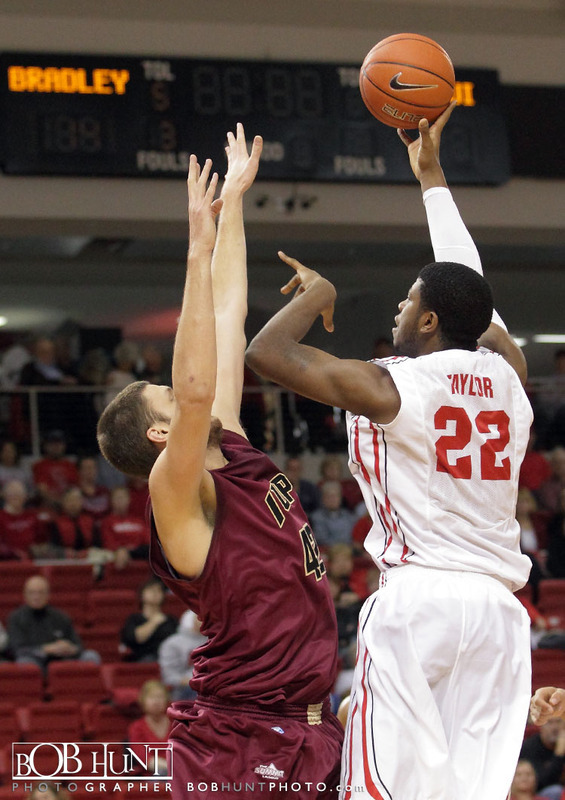 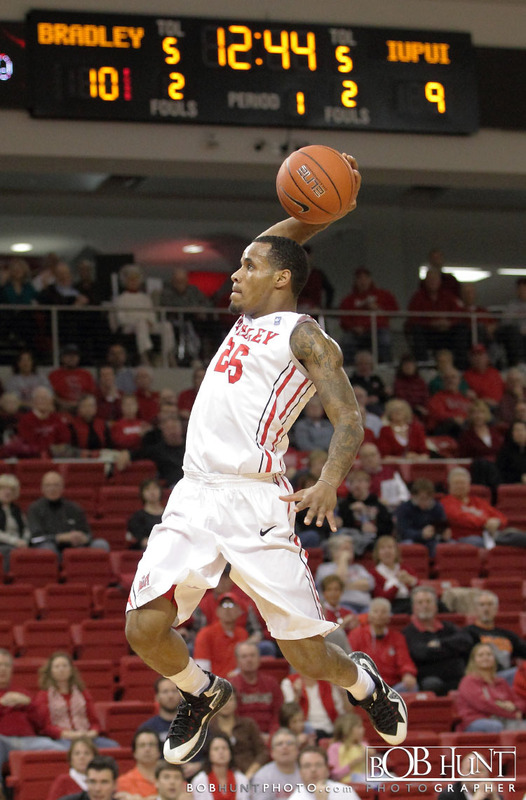 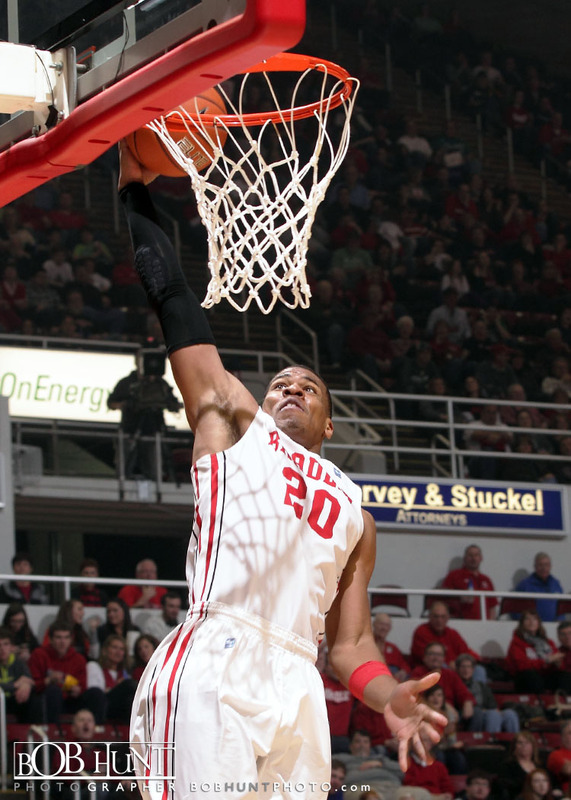 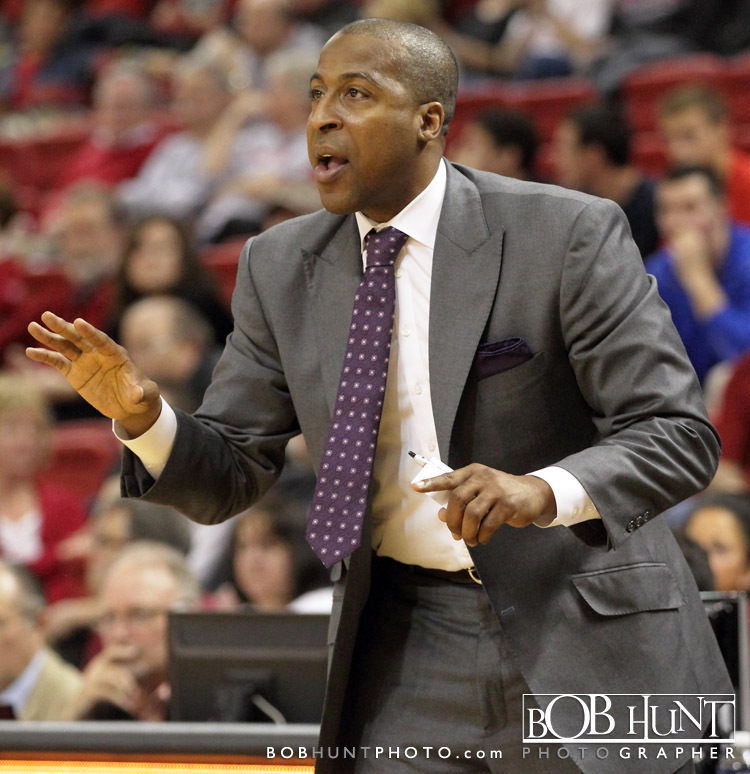 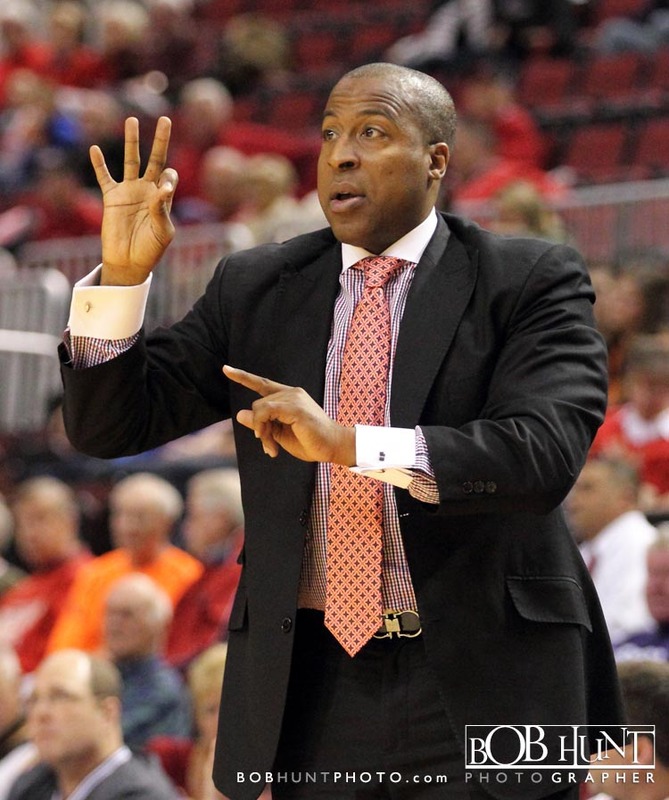 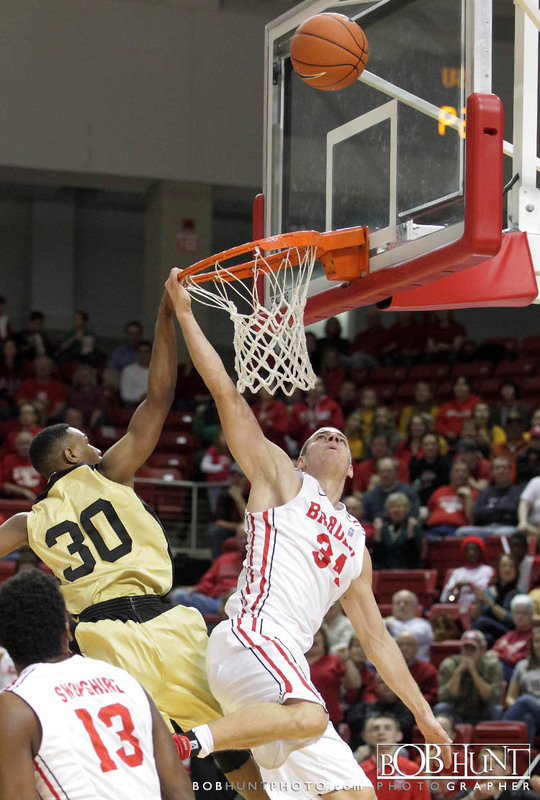 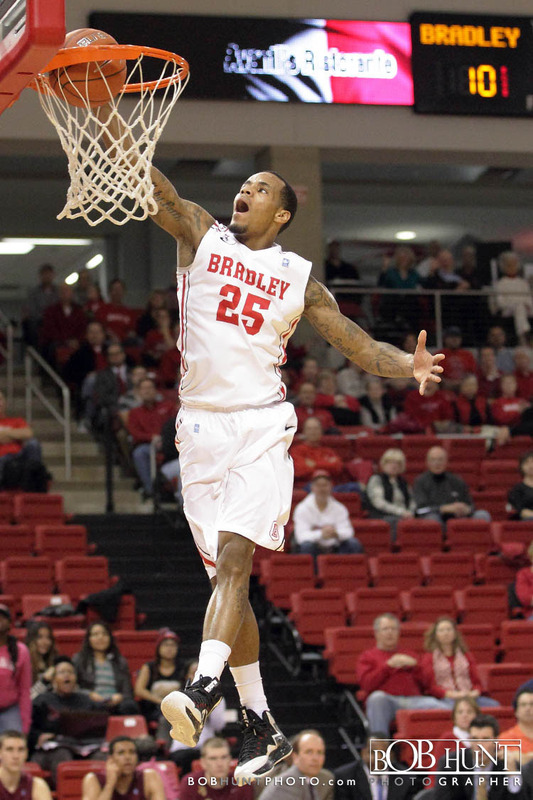 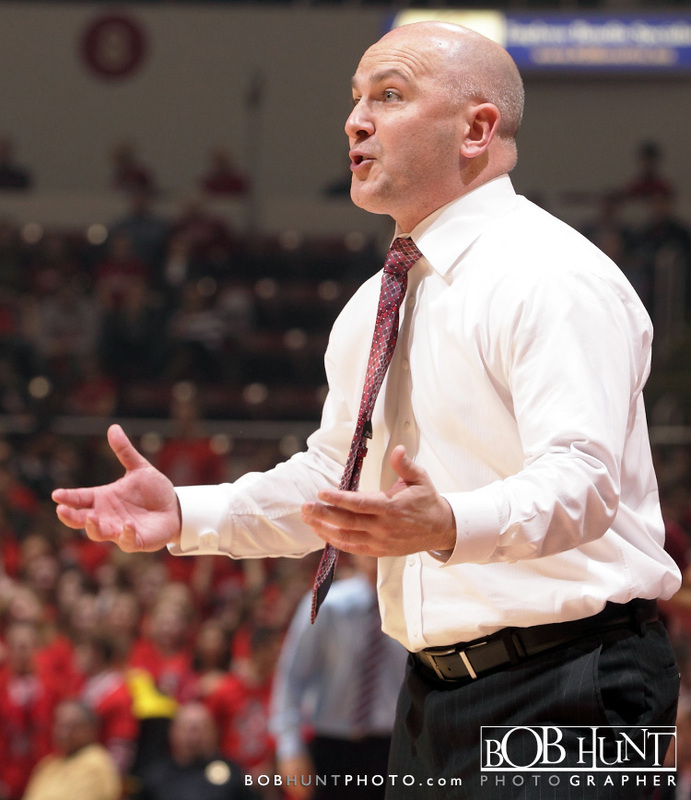 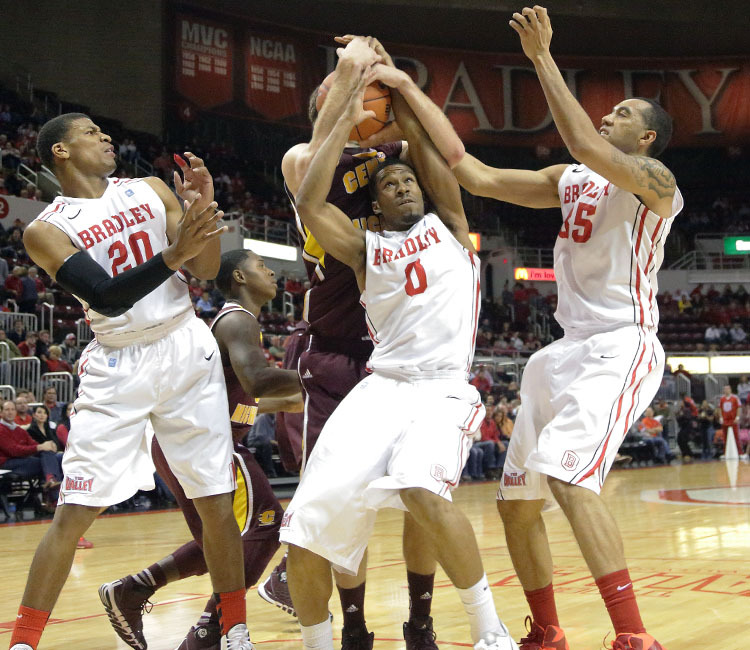 Bradley University used its best rebounding game in eight years and improved to 3-0 for the third consecutive year, out-muscling Central Michigan for an 80-70 win Tuesday night at Carver Arena. 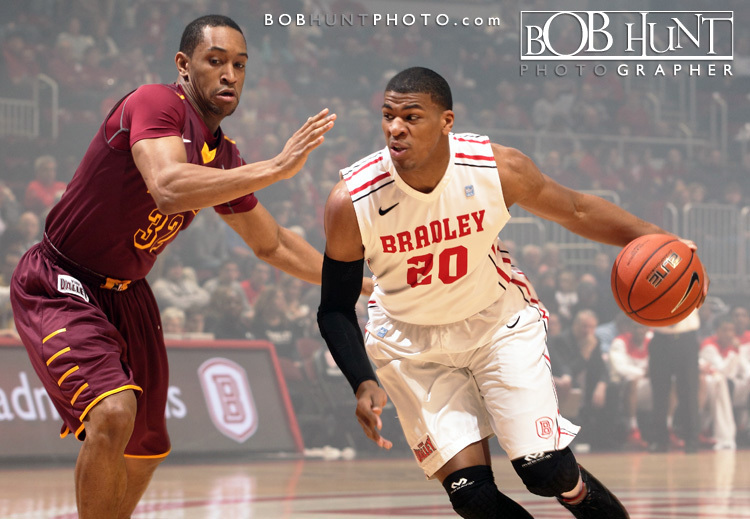 Senior forward Tyshon Pickett led the charge with 19 points and a career-best 12 rebounds for his second double-double in three games. 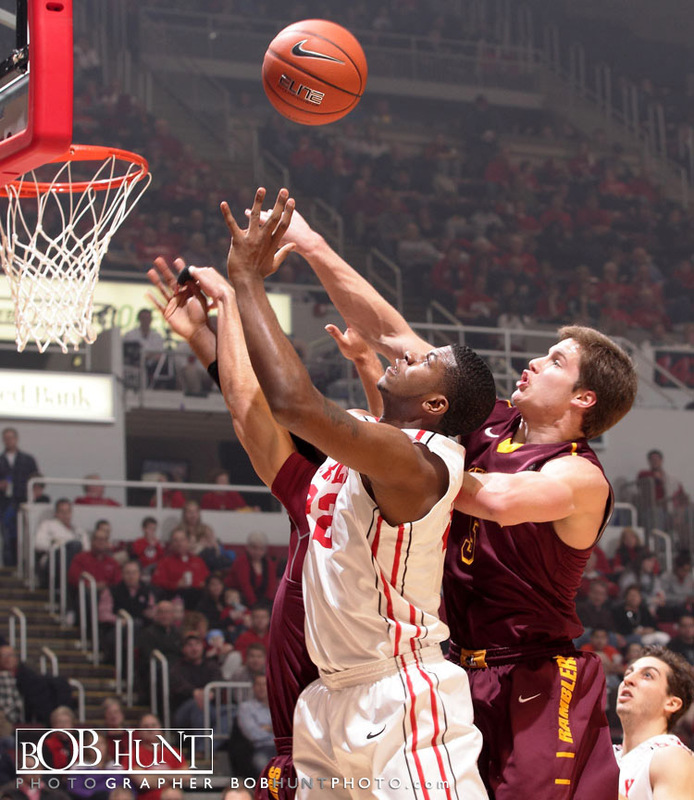 Auston Barnes, who began his college as a walk-on at Central Michigan from 2010-12, added a double-double of his own with career-highs of 13 points and 10 rebounds, while junior center Chris Blake added a third double-digit rebounder with 10 boards. 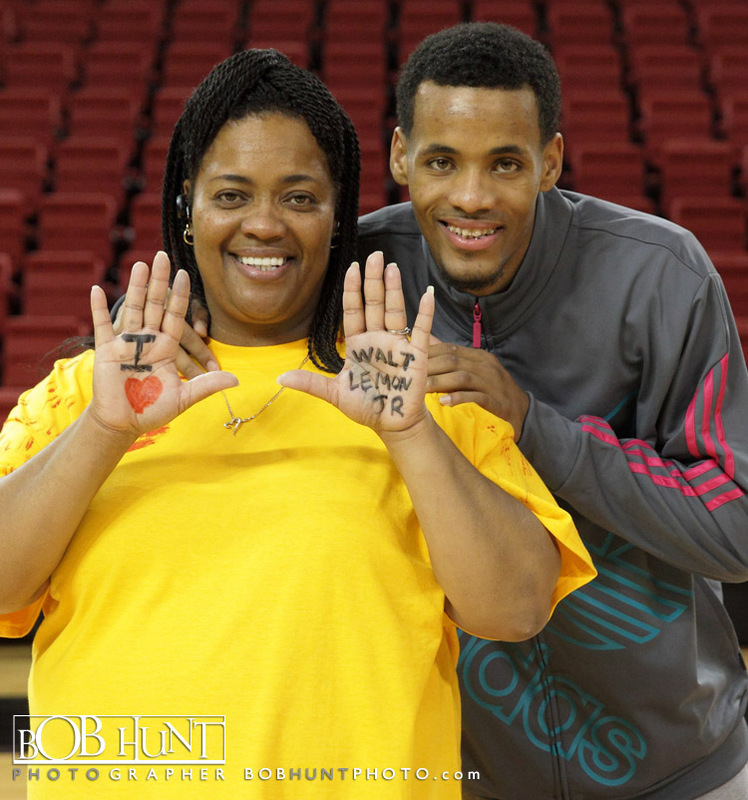 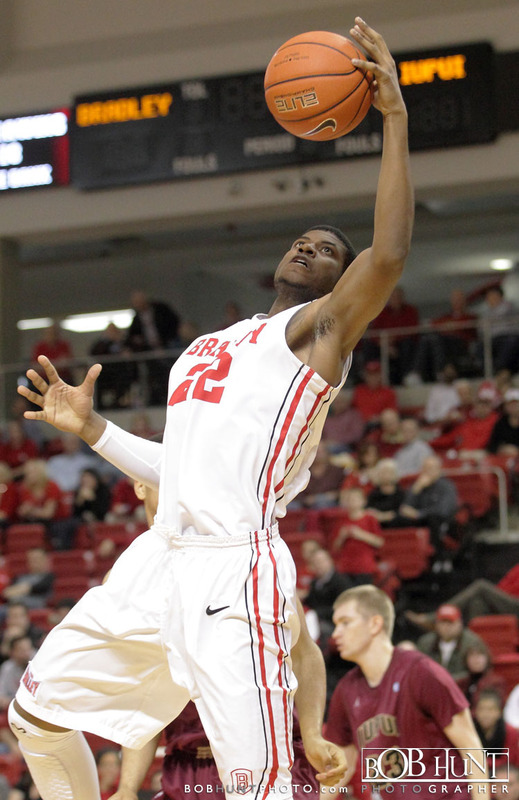 Even point guard Walt Lemon Jr. got in on the act by adding eight rebounds to his team-leading 20 points. 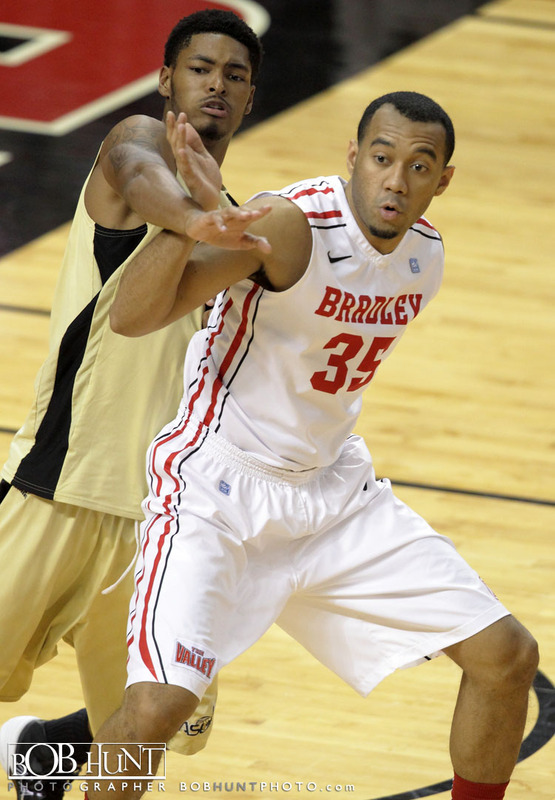 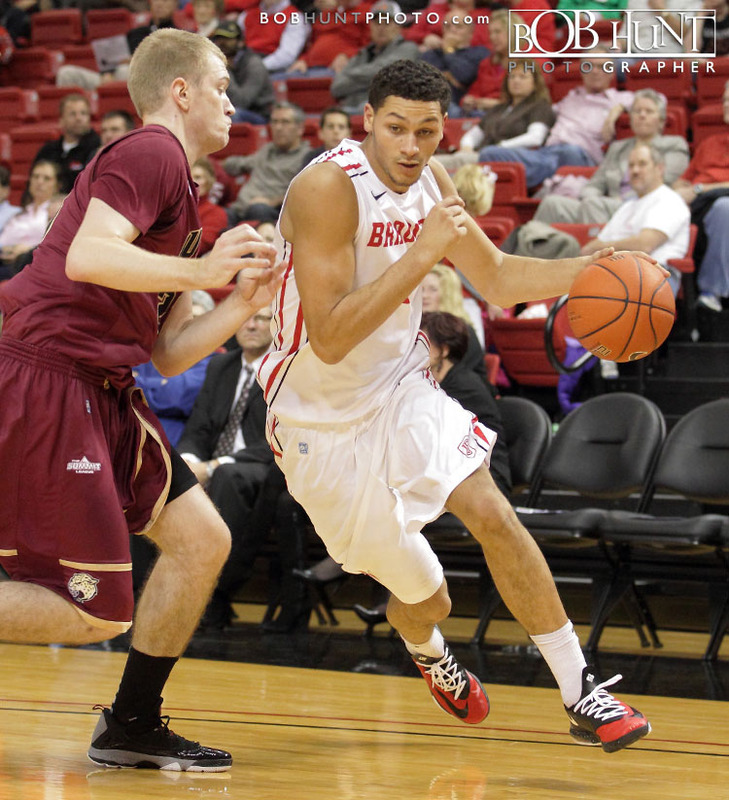 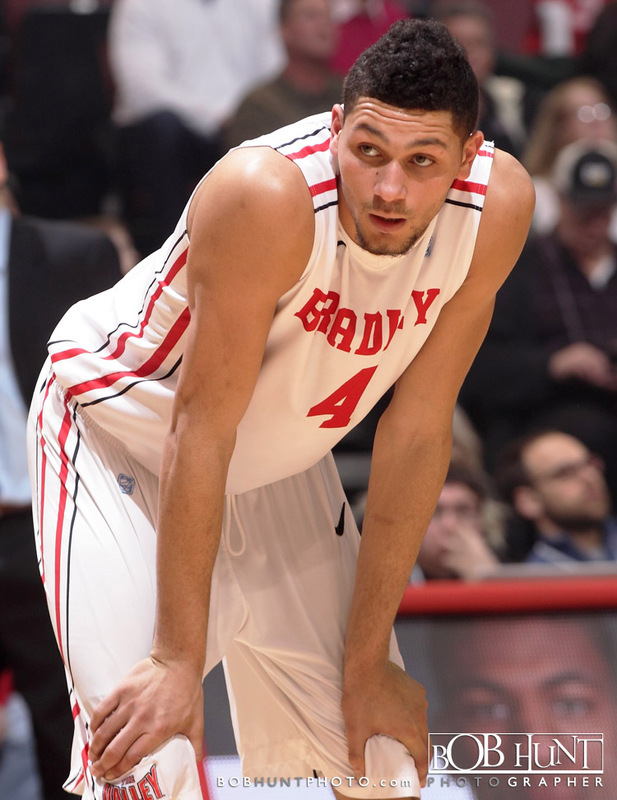 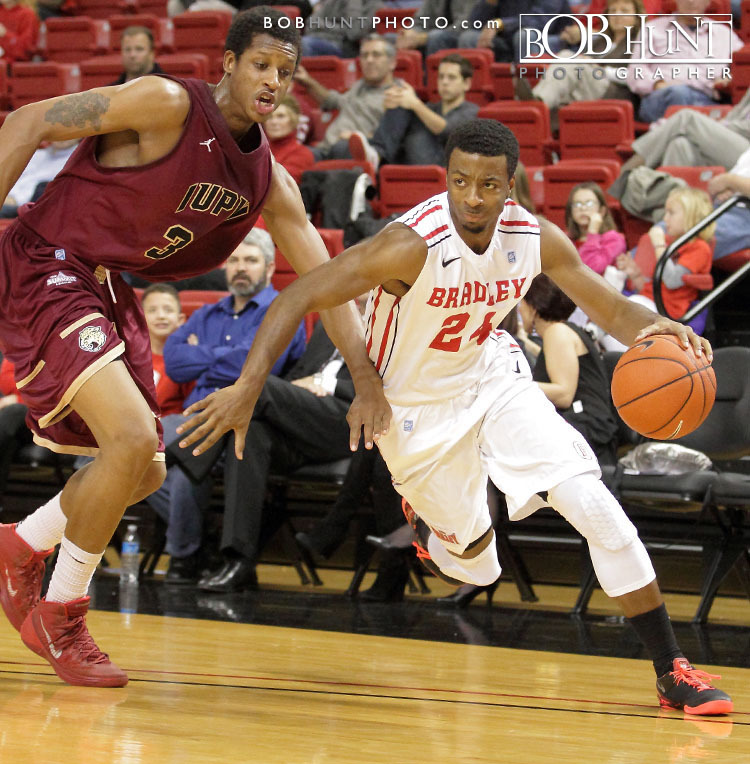 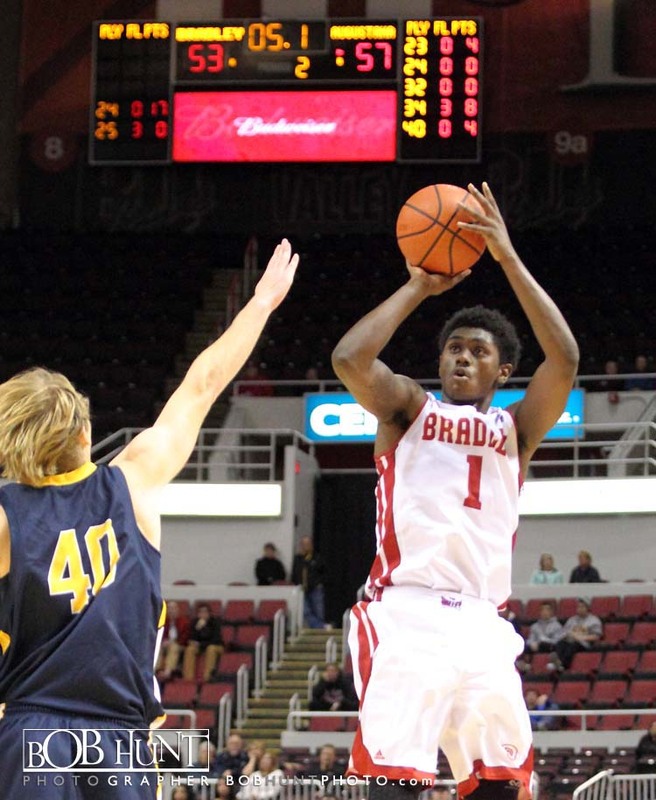 Omari Grier was Bradley’s fourth double-digit scorer with 12 points. 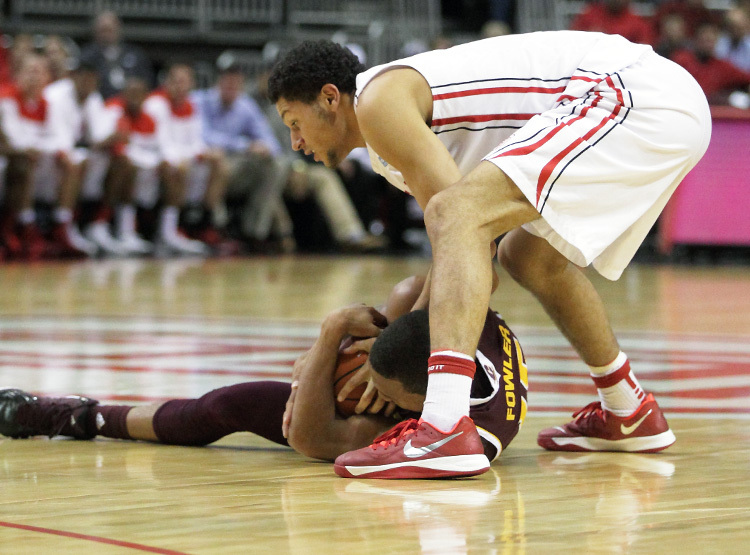 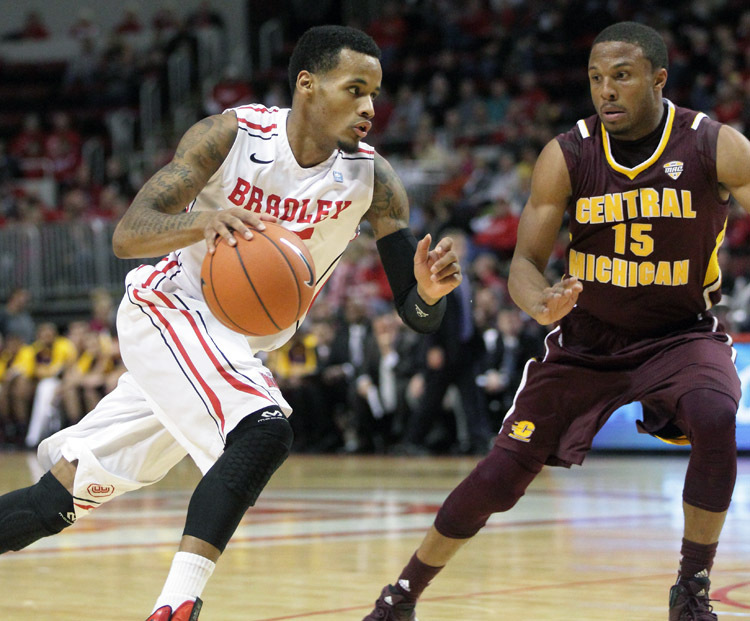 Chris Fowler led Central Michigan with 20 points. 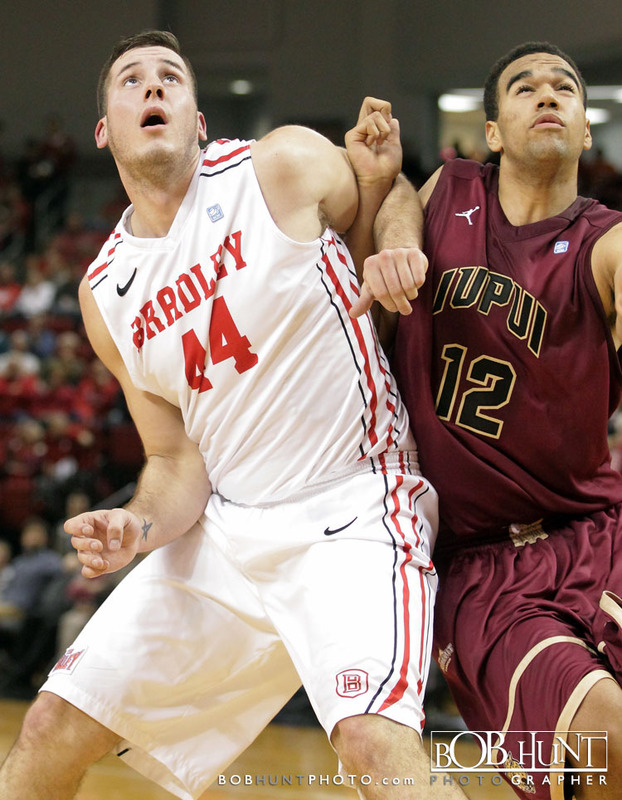 John Simons added 14 and a team-best six rebounds for the Chippewas, while Austin Keel chipped in 15 points. 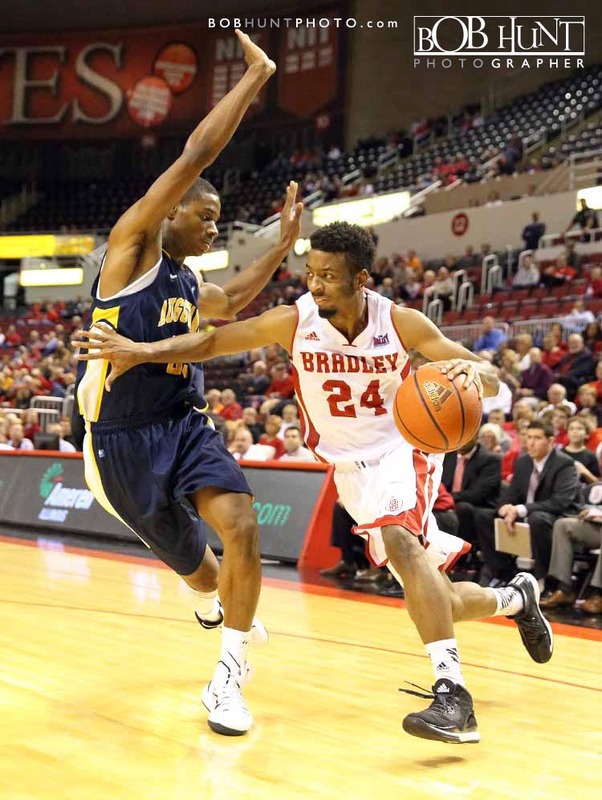 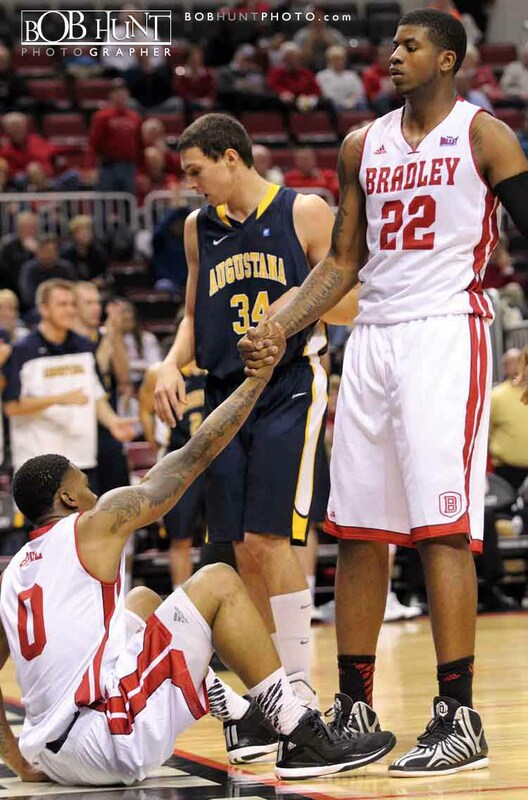 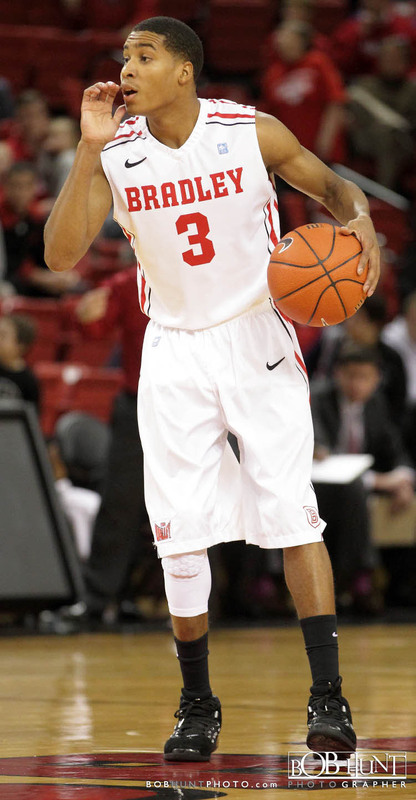 With his 15th career 20-point game, Lemon became the 31st player in Bradley history to reach 1,200 career points, pushing his total to 1,201 in his 101st career game. 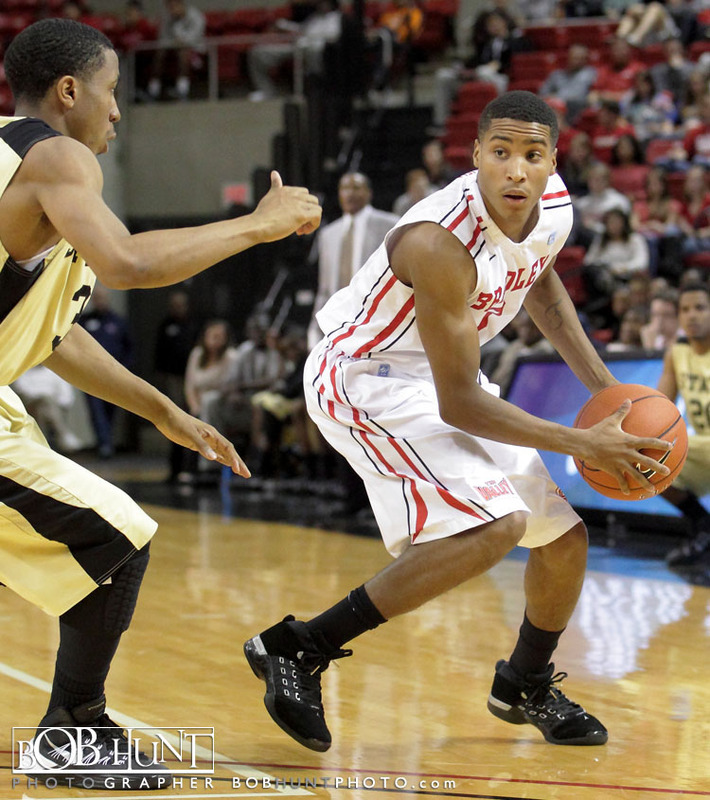 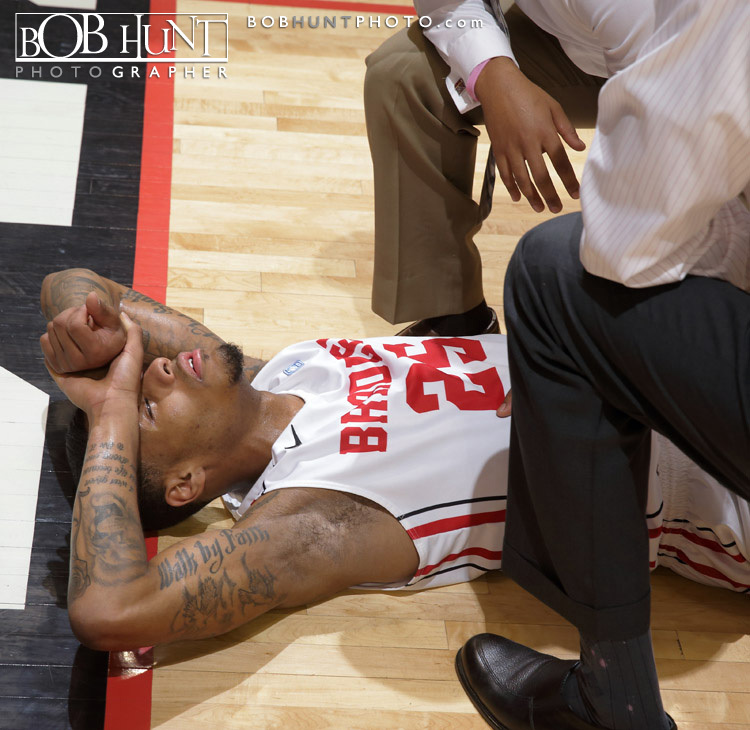 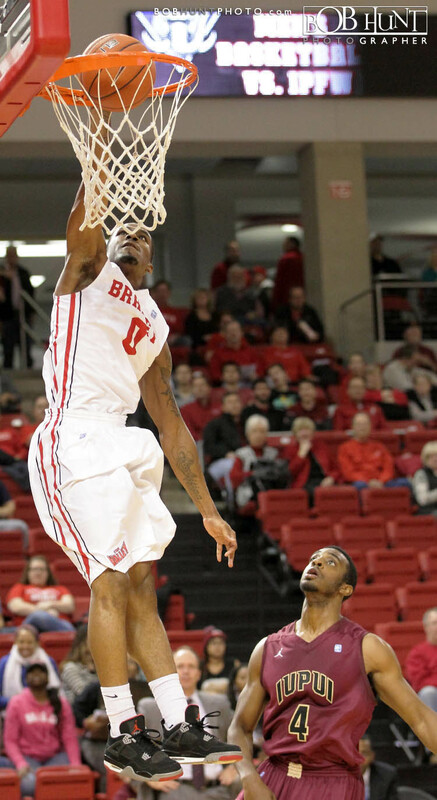 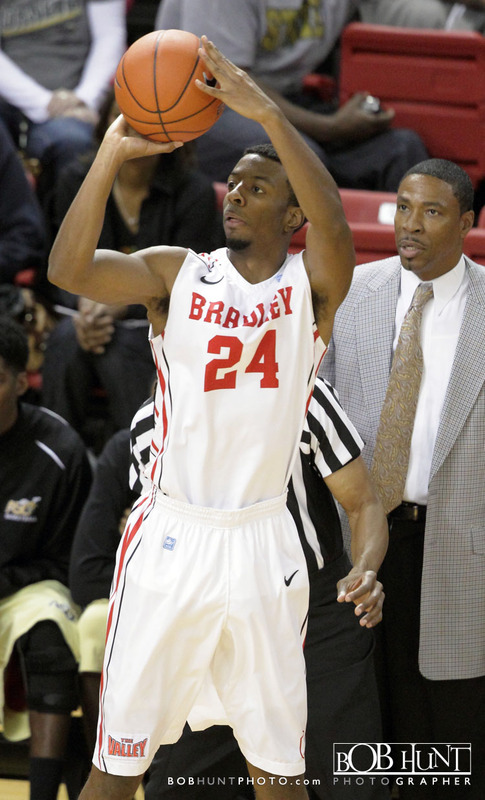 Walt Lemon Jr. led three Bradley University players in double-figures with 19 points, while adding six assists and three steals, and the Braves (2-0) cruised to an 85-59 win against Alabama State University (0-2) in the second round of the Global Sports Invitational Sunday evening at Renaissance Coliseum. 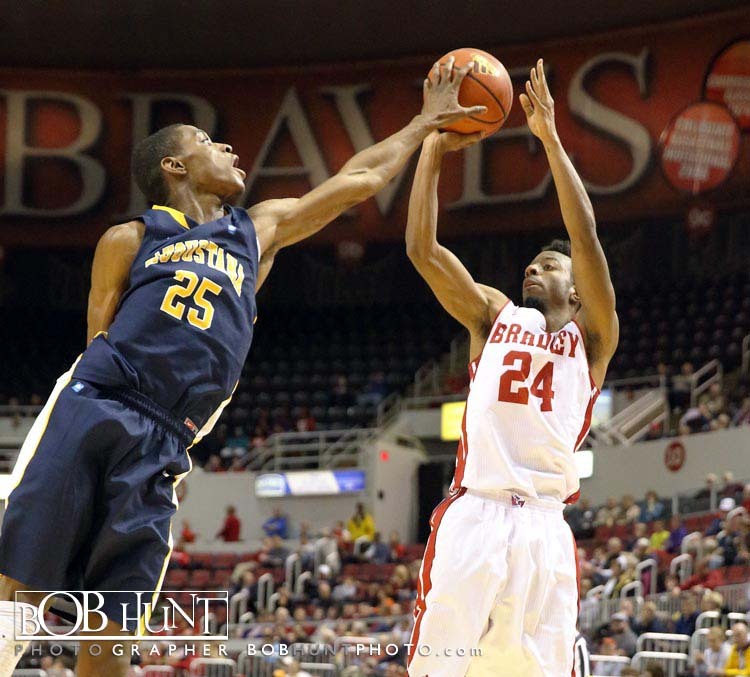 The Braves improved to 5-0 all-time in their on-campus arena and Sunday’s 26-point margin of victory was their largest at the Coliseum. 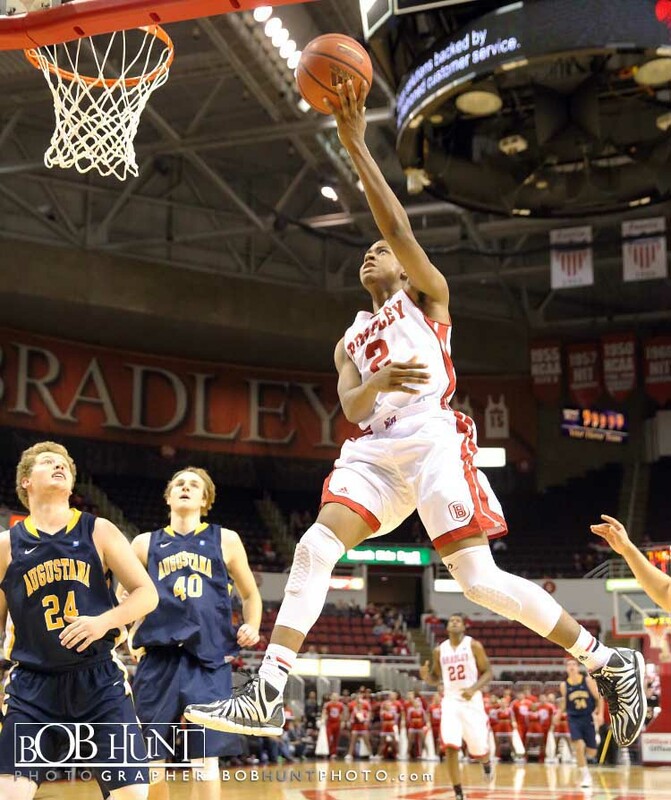 Sophomore guard Omari Grier added 14 points for the Braves and junior forward Auston Barnes added 12 points and seven rebounds. 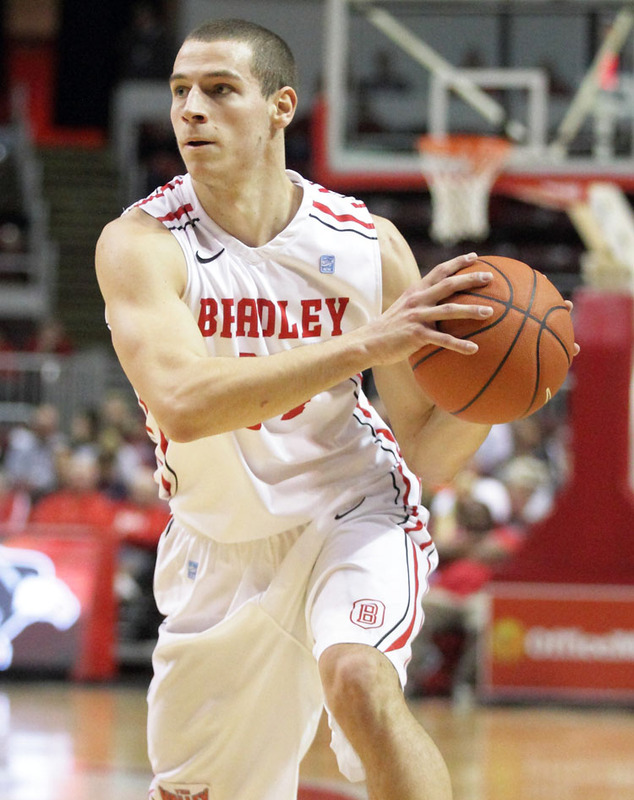 The duo combined to make all six (6-for-13) of Bradley’s 3-point field goals. 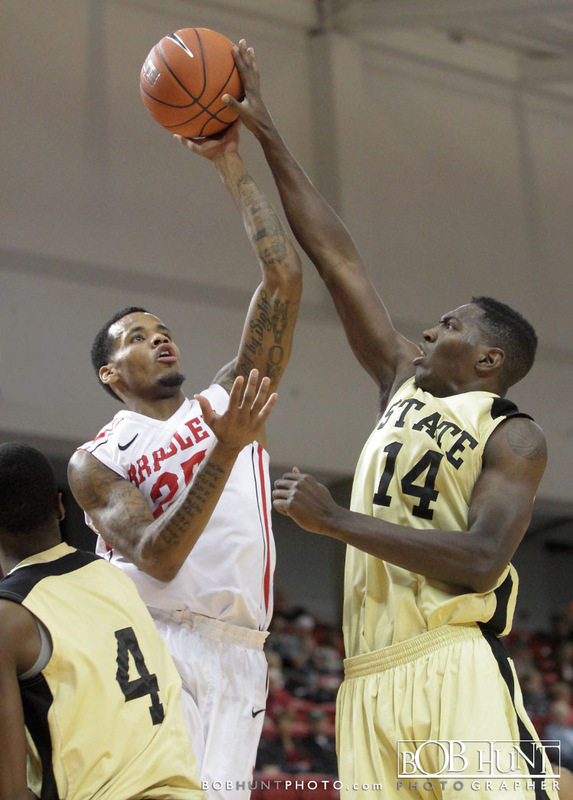 Jamel Waters led Alabama State with 14 points and a game-high seven assists, while Luther Page chipped in 10 points and seven rebounds for the Hornets. 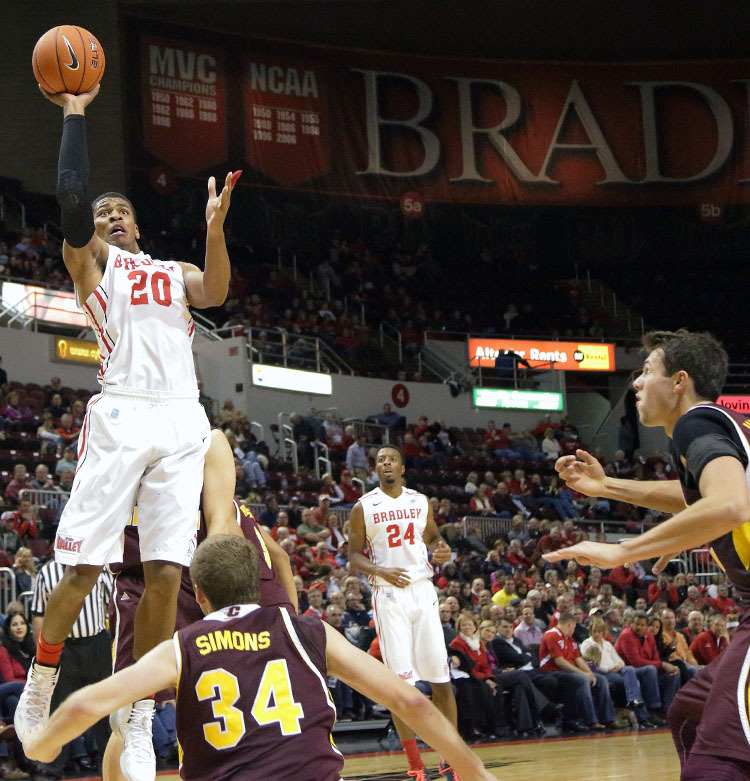 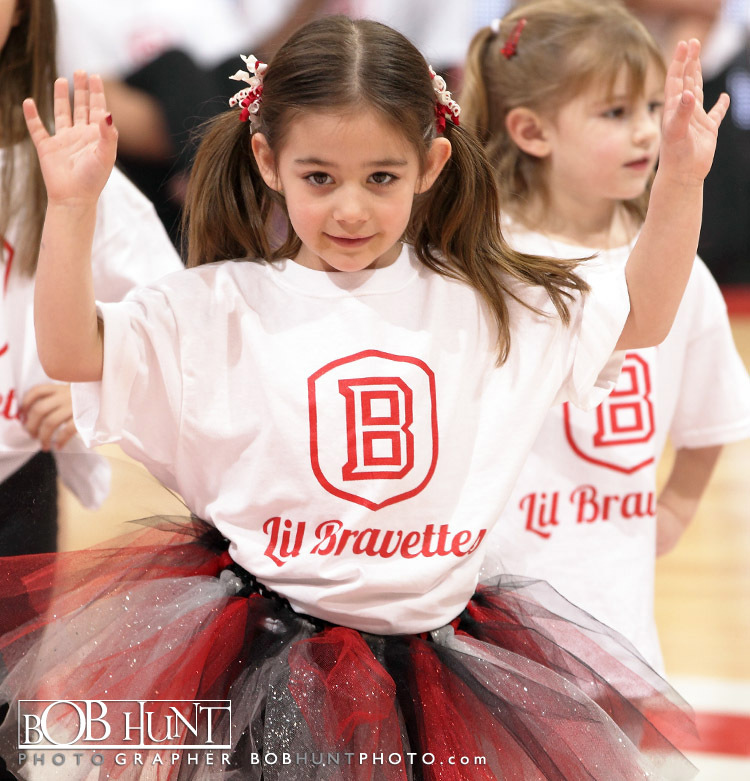 The Braves will have little time to celebrate their fourth consecutive 2-0 start as Bradley will host Central Michigan in a 7 p.m. game Tuesday night at Carver Arena.